Additional information on raising chickens. 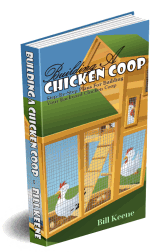 Thankfully Bill’s book ‘Building a Chicken Coop’ not only met all the above requirements, it was also packed full with additional information about keeping chickens, and even more impressive was the 4 free bonuses that you receive! Another welcome addition to this package, and something missing from so many resources online, is the detail that Bill provides on actually preparing for your chickens in the first place and the important things that you must consider: bedding, climate, selecting a building site for your coop, breeding chickens, caring for baby chicks, and so much more. Another great aspect of these coop plans is that you get access to them immediately, and even more importantly, once downloaded you can print off as many copies as you like, so if they get dirty or damaged and you need a spare copy for your helpers, then there’s no problem at all. If you’d like to read more at Bill’s site please check it our here. However, if you’re like us and can’t wait to get your hand on this, you can order now via this secure online ordering page. It’s risk free, with a 60 day Money Back Guarantee, so why wait?! So what exactly do you get in Bill’s Chicken Coop Plans book? Rules and Regulations for Raising Chickens – Where do I start? It all depends on what you’re hoping to achieve. Are your chickens purely in the backyard to keep the grass down and provide your family with a pet or fresh eggs? Or are you aiming to be the Chicken Queen or King in your suburb? If you’re considering using your backyard set-up to make money, either now or in the future, find out first about the council regulations in your area. It could save you a lot of time, money and heartache in the future! Backyard chicken ownership is regulated by your local council. Commercial chicken ownership is regulated by government departments in your state, responsible for areas like planning and primary and your local council. Nationally, the relatively new Australian Egg Corporation at http://www.aecl.org/ provides information and guidance on poultry-keeping. Membership is voluntary and well worth considering. Commercial egg sales must comply with basic egg handling rules set down by Food Standards Australia. You can find out more at- www.foodstandards.gov.au. Keeping chickens safe can be a big job. Predators, whether in the city or rural areas, can be very persistent. The key is making their pen or chicken coop as secure and strong as possible. Use as many security measures as your budget will allow. Regularly check screens and wire for holes and tears. Consider lining the floor of your coop with chicken wire or concrete if possible. Some people dig walls 30 cm into the ground to stop predators digging between walls and floor. Before using ‘Rover’ to protect your chickens, make sure he’s the placid type, and won’t chase them. Are the chickens familiar with the dog? Can they override their natural instinct to be scared of large, loud animals? Think about this before settling on a guard dog – or the poor chickens might die of fright before the predators get near! Geese, donkeys, llamas and alpacas have all been known to scare off predators around chicken coops. This has to be one of the coolest Chicken Coops I’ve ever seen. It’s from the guys over at Omlet.co.uk. It’s definitely not a DIY coop, sorry. But if you’re too lazy to build your own, and you’ve some money burning a hole in your pocket, I’d definitely recommend this one for the ‘cool’ factor alone. 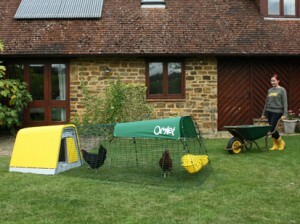 This particular coop is called the Eglu Go and is designed to house 2 chickens producing 10-12 egs per week. Nice. If you live in an area where you experience temperatures of over 100 degrees Fahrenheit / 38 degrees Celsius, it is a good idea to avoid the large-sized and feathery chickens. In hot weather, most Bantams do well with the exception of the feather-footed varieties. If you live in a cold Climate are where the temperature drops below freezing during part or all of the year, it is best to have Standard Chickens rather than Bantams. Standards are hardier and fare better than Bantams in cooler to cold climates. Chicken combs and wattles are an important factor to consider since the smaller they are, the less they will be affected by frostbite. Despite the many advantages of raising backyard chickens (fresh eggs! fresh chicken meat, family fun, eco-friendly to name a few) the practice is still quite uncommon. Most people are simply not aware that aside from the healthy eggs and poultry meat chickens can provide their family on a regular basis, chickens are fun pets too that your kids can cuddle. Below are some important considerations that should be carefully evaluated if you are thinking about raising backyard chickens. Do you have time to look after your chickens? Although chickens are relatively low-maintenance, they do require time for daily care. While the amount of time is small, i.e. you only need 15 to 20 minutes daily for feeding, water and taking care of bedding, it’s important that you begin your chicken raising with eyes wide open and know what commitments you have to make. If chickens are kept in a chicken coop then you have to make sure that the chicken run (where they are allowed to range freely during the day) is big enough and secure from predators. It is recommended that at least six square feet per bird is available in the outside run. Ultimately though, the more space the better. Chickens are also natural foragers. They eat insects, grass, weeds and anything else that they can find in their chicken run – the more they are able to forage, the healthier and more contented they will be. Apart from the obvious, why else are healthy chickens beneficial to you? It means tastier eggs and poultry meat. When chicken roam freely, they also get a great deal of exercise and keep themselves fit and entertained. Another side benefit is that they will keep the grass maintained, so less time spend mowing! Chicken droppings also make great fertilizer so your back yard chickens will help fertilize your lawn for free. I’ve posted this video on Youtube. It gives some good insight into what mistakes to avoid making when you are building your own chicken coop. Let me know what you think. Video below of a guy who’s designed Chicken coop plans that resemble a play house. 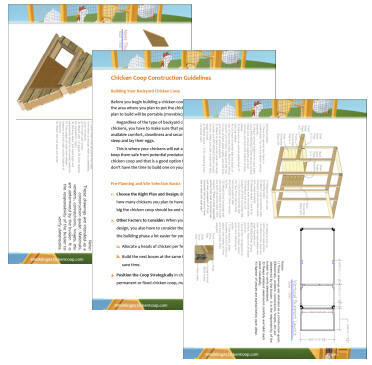 More Chicken Coop Plans – How to Build a Chicken Coop in 3 Days. 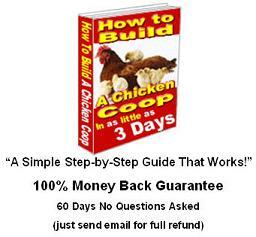 “How to Build a Chicken Coop in 3 Days” is by far the easiest and most detailed guide available. Unlike the others, there’s actually a members community and you’re not taken to a cold-harsh page that just says “download your book.” You even can e-mail the guy and see that he always responds to ANY questions relating to chickens usually within a couple hours (at most!). You also can get answers to questions in the members only forum 24 hours a day 7 days a week. There’s nothing like it. The members area will soon cost $97 since they’re adding videos for June, but they’re running a special where the next 100 people can get in now for just $37. At this price, knowing that you can always get answers to any questions you ever have about raising chickens and building chicken coops it’s a bargain. You also have 60 days to try it out with their 100% money back guarantee. Discover How To Easily Build An Attractive And Affordable Chicken Coop That Protects Your Chickens From Predators Maintains Their Health And Delivers More Delicious Eggs. Want to save time and money? Get your copy today!